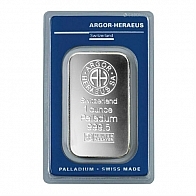 One of Switzerland's four most prominent precious metals refineries, Argor-Heraeus is a producer of palladium bars. Argor-Heraeus palladium bars are available in a range of sizes, from 1 gram to 1 kilogram, and multigram palladium bars are also available. Argor Heraeus palladium bars are recognised as being manufactured to some of the world's highest standards, and are also recognised by the LBMA, the LPPM and the COMEX. 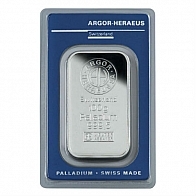 For individuals looking to buy palladium bars to add to a portfolio, Argor-Heraeus palladium bars are an excellent choice.